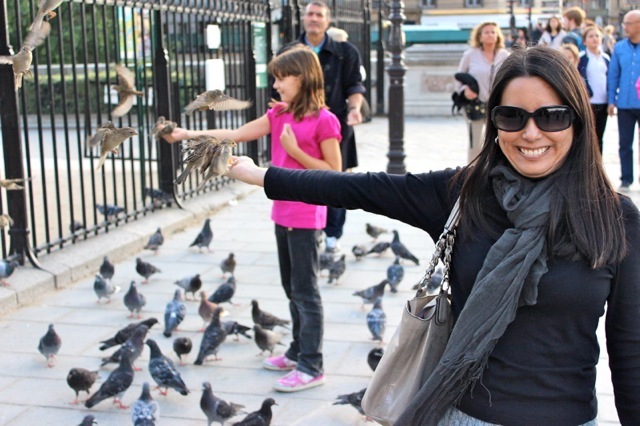 Feeling free as a bird at the Notre Dame Cathedral in Paris. Welcome to my blog! I was born in Okinawa, Japan. My parents met in Okinawa while my dad was stationed there while he was in the Marine Corps. My dad is now retired from the Marine Corps and they are both still happily married for over 40 years and live in the Central Florida area. I met my husband in 1995 at Walt Disney World after auditioning for a job right after graduating from high school. We both worked in their character department for several years while in college. Let’s just say that I was very “good” friends with Mickey & Minnie. We dated for about 5 years before getting married in September of 2001. In 2007, we had our amazing daughter, Mia and our life has changed in so many ways since her birth. We are excited to show her as much of the world as possible. My husband and I both lived in the Central Florida area for about 25 years. We had a life changing moment after both our home and our next door neighbor’s homes were broken into in the middle of the day and in an instant, so many of our “things” were taken from us. We then really realized how unimportant those “things” we had managed to accumulate over the years were. In 2012, we decided we would start working on simplifying our lives and in 2013, we were successfully able to do so after donating about 3/4 of all our belongings and most of our household items went on 2 truck loads to the Salvation Army. We downsized from a 4-bedroom home to a cute 2-bedroom apartment that was less than half the size when we moved to Helsinki, Finland with only suitcases! This allowed us to work more on our travel bucket list. We also experienced traveling via public transportation for the first time and did not have a car while we lived in Finland. We moved on to our next life adventure with only suitcases again to a new country during the summer of 2014… someplace a lot more sunny and warm where we are enjoying a very relaxing view of a breathtaking turquoise sea. We are grateful for a new expat experience, and it is a lovely change from the cold and darkness of Finland! My blog features photos from our travel adventures and some posts about living abroad as an expat. I hope you enjoy following along with our Red Pin Adventures and I look forward to meeting some fellow bloggers along the way! Super happy to have found your blog, Finland is one of those countries that I find absolutely fascinating. What made you guys move there? I totally agree with you about simpliflying life!!!! Me and my husband are in that mood too!! We don’t neet to HAVE things to be happy we need to DO things that made us happy. Loved to find your blog!! Happy blogging!! Yes, I agree. It’s much more fun DOing the things that make us happy and not focusing on things. I enjoy making memories now by seeing and experiencing things we have never tried before. Looking forward to following along with your Rio adventures! Happy blogging to you too! Thank you so much for stopping by my blog, and deciding to join me on my journey. It’s an honor to have you follow along. I’m so impressed that you moved from Florida to Finland!! Wow! That is quite a jump! 🙂 I’m not quite as adventurous, but I am certainly going to enjoy your adventures! I enjoyed reading about you on your blog. Yes, it has been quite the jump from Florida to Finland!! We finally have some snow that has stuck to the ground this past week, so it is much more cheerful here in Helsinki. It was so dark and it is amazing how the snow really brightened things up including everyone’s moods! I look forward to following along with your adventures too! thank you for following my blog! happy that you like it 🙂 what an interesting blog you have ! for sure will be back here 🙂 have a happy week ! Thanks for dropping by, you’ve got some good posts up so please do keep posting!! I would love to keep reading more about your expat adventures, I’ve always found it interesting to find another perspective when people live elsewhere. Thanks for stopping by and for your kind comments! I am glad you are enjoying reading about my expat adventures. Our next adventure will be to St. Petersburg! I’ll stop by your blog again soon! Fantastic! Finland must have been a completely different experience to Florida. Where is your next expat experience and how is Mia coping with it all? My partner and I have collectively lived in Kuala Lumpur, London, Rome, NYC and now Sydney – we find it difficult to stay in one place for very long. Next stop – Buenos Aires! But we are wondering what effect our constant moving around will have on our hypothetical, future family. Would be good to get your thoughts on living overseas with children. Hi Peggy, Thanks for stopping by and so sorry for the delayed response! The move has taken over my life these last couple of weeks. I will be so happy to be back to a routine and can focus more time on blogging. Wow!! You have lived in so many interesting places! Australia has been at the top of my list since I was a little girl… we are planning to finally make it there for a visit sometime next year. Look forward to reading about your travel stories past, present and into the future!! Thank you for following along with my adventures! I see that you are from Australia! I have met more people from Australia in the past year than I have my entire life… I think it means that I am getting closer to my dream as Australia has been at the top of my places to see for so long! I look forward to following your adventures too! Hope you are having a great time at the World Cup! Are you still in Finland or have you moved somewhere else? Thanks for following our blog. I hope you enjoy the stories of our journey. Thanks for stopping by! Yes, cold dark winters are tough to get through… I only survived one, and my hubby did two! That was plenty enough for us Floridians!! Ha! Happy to have found your lovely blog. I enjoyed reading about you and Don and I look forward to following along with your travel adventures too! We hope to be doing exactly what you are both doing for as long as possible! Thanks for following my blog! Really looking forward to reading more about your expat adventures…amazed at how you guys managed to downsize. Not an easy task at all. Thank you for following my blog! The life of an expat can be very interesting. I lived like that for quite a while and enjoyed every minute of it. Keep on! Thank you for visiting my blog and the follow. You have wonderful pictures on your blog and I look forward to viewing more of your posts. Hi Christine, just a quick thank-you for following Beauty Along the Road. It is very much appreciated. I love that you and your husband decided to downsize and focus instead on experiencing the world rather than becoming debt slaves to corporate America. Your story is lovely! I’m working on the “downsizing” aspect of life… so much easier said than done. Travels to nature spots are on our list. Hi Jane, Yes, downsizing is certainly easier said than done! I do love your nature photos! The Unless Challenge is a great concept, and from one of my favorite books! I look forward to following along!